Need Something to Inspire You? Fall for Community Mapping! You are at:Home»Seriously Good For All»Need Something to Inspire You? Fall for Community Mapping! Fall is here! To dive into an innovative and fun school year, the Jane Goodall Institute’s Roots & Shoots program has a unique activity that everyone will love. 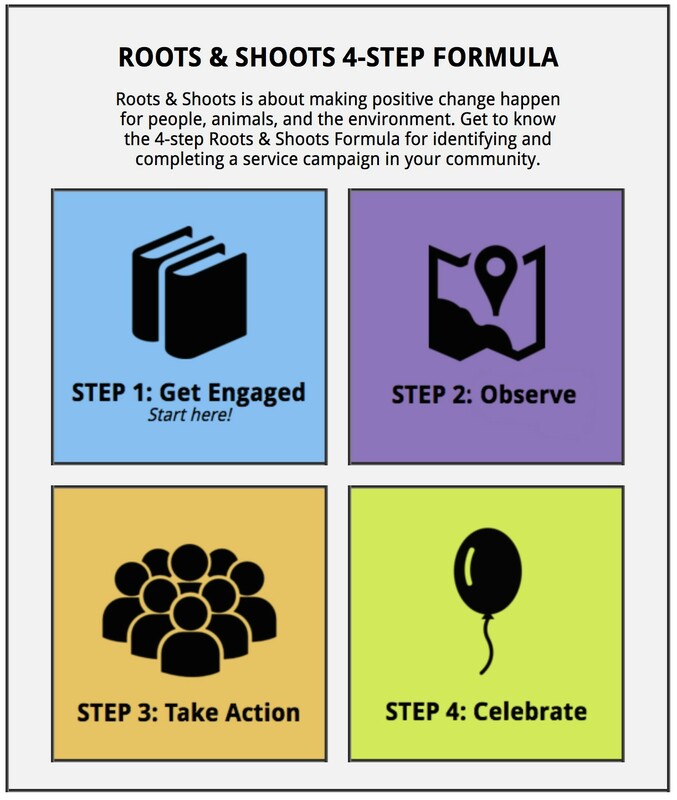 During these sunny Fall days where we have ample time to adventure and a thirst to make an impact on the world, the Roots & Shoots 4-step formula (shown below) can come in handy for crafting simple and local service projects that are fun and help people, other animals and the environment in your community! After getting engaged and inspired by Dr. Jane’s story in the R&S formula’s Step 1, you should start mapping! 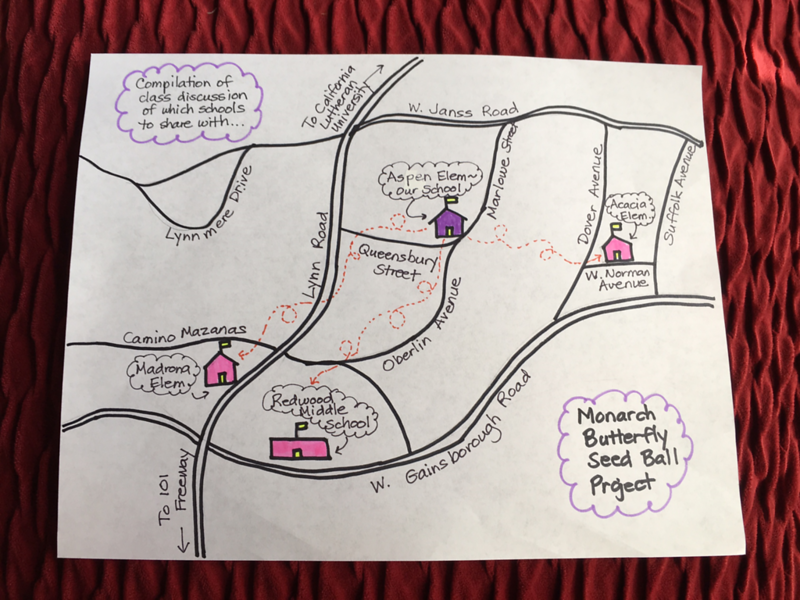 Step 2: Community Mapping is a fun and crafty introduction to scoping out the perfect project. The idea is that anyone can map out (on paper or online!) the main features of their community, and by doing this, be able to recognize areas where they can help people, animals, and the environment. They will also be able to identify resources and other functions of the community that could be useful to building project based solutions! Community mapping can be as simple as breaking out the crayons and craft paper for to plot out homes and neighborhoods, or older changemakers can explore the opportunities to use Google MyMaps or ESRI ArcGIS to map more extensively and create ongoing community-wide projects. Learning to map electronically can be an invigorating challenge for young people of all ages. More information on mapping tools as well as instructions can be found on the Roots & Shoots mapping page. Part of this step is also thinking about how the elements of the map overlap and have relationships, and our place in it all. For example, by mapping out the major stores and parks, the Roots & Shoots young person may find a lot of litter and trash in their community. Like U.S. Roots & Shoots Youth Leader Abby A. did, you could set up a project to clean up the area with your family, friends or the entire town! The next step is to take action and to carry out the clean-up. It’s amazing what can be accomplished once who see the big picture! The final step (Celebrate!) takes place when the project is shared on social media and in your community to inspire others. When you upload your project to Roots & Shoots website you’ll be sharing your ideas and success with thousands of others around the world. Being able to share your ideas helps others either replicate or build on your projects, building a tapestry of hope in nearly 100 countries! 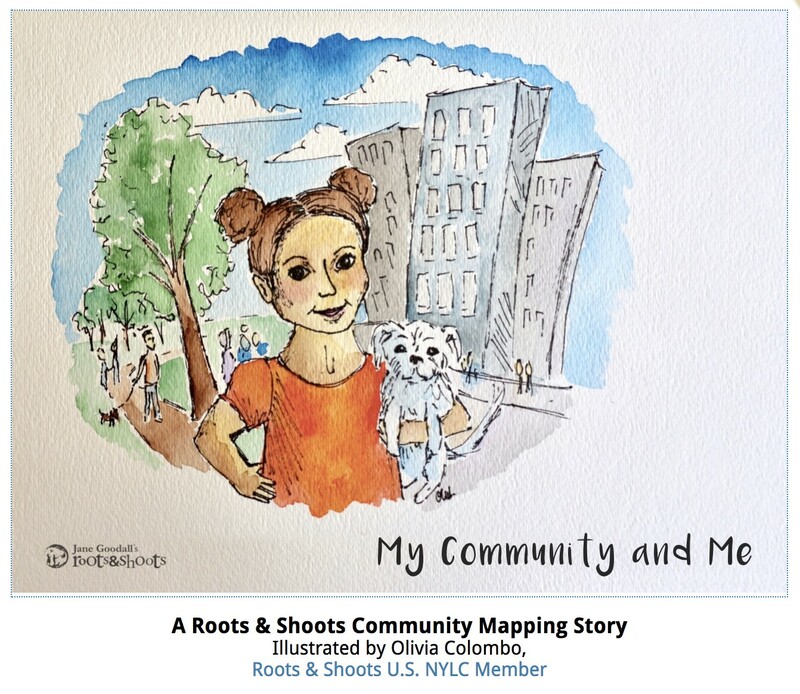 JGI’s Roots & Shoots is excited to share a relatively new tool for introducing the concept of mapping and exploring their communities: a children’s book! This short picture book, illustrated by Roots & Shoots Youth Leader Olivia Colombo, follows a little girl Anya as she excitedly witnesses the beauty of her surroundings and comes to the conclusion that she wants to map it all. Download or view the ebook here to use Anya’s story to inspire a little map of your own community. 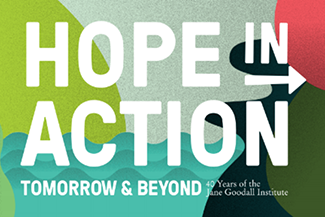 Will you be joining us in mapping out how you can make a difference? Be sure to check out the Roots & Shoots formula toolkit for instructions as well as the My Community & Me children’s ebook. Share your maps with us on social media by tagging @rootsandshoots #RSGoodForAllMaps — show us how you can make a difference in your corner of the world. Happy mapping! Previous ArticleJane is a Global Compassionate Citizen – Are You?